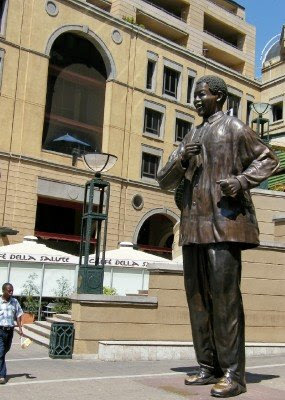 If you ever go on a proper Township Tour the guide will probably take you to one of the local schools or creches that their company supports. One of the tours I went on a little while ago took us to a community project that started as a feeding scheme for small children and developed into a day care and pre-school. Although the tour company gives the project a percentage of the fee that tourists pay for the tour, visitors always make some donations to the school or take along stationary and the like. 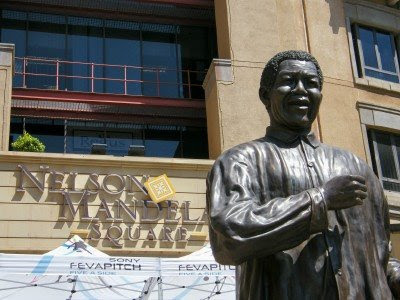 Through the help of tourists many such projects are run throughout the townships of Port Elizabeth. The kids always love it when the visitors take pictures of them during the visits. After the photos is taken they all line up to see the image on the camera's screen. The photo may not be a artistic picture of any kind, but I love the emotion from the kids. 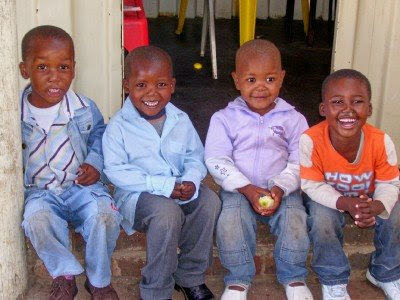 It doesn't matter what kind of circumstances these kids live in, they are always happy, laughing and playing. Enjoying life, even if they are being short changed. I often think that kids in rich neighbourhoods can learn something from these kids on how to enjoy childhood. 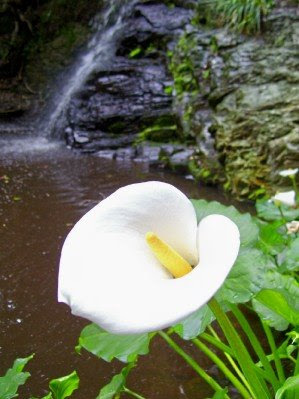 By far one of my favourite flowers is the Arium Lily. The grow very much wild in the Tsitsikamma forest because of the high rainfall and lot of water there. Some of the are huge compared to those you see in people's gardens. When I used to be a tourist guide I got to visit the Tsitsikamma very often, but alas I haven't been for a while. This pic I took on the Mouth Trail in the Tsitsikamma National Park next to a little stream and waterfall. I just thought the background went very well with the flower. 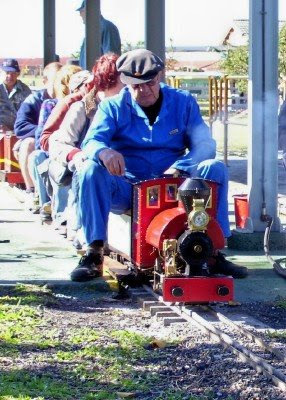 On the first Sunday of each month the Port Elizabeth Model Locomotive Society brings out their trains to the delight of young and old. I'm normally very stoked (excuse the expression) when I get to go on the little steam engine. It actually runs on real coal and water just like a real steam engine. It even blows off steam like his big brothers. Each engine would tow about three little seater wagons and the trip takes you in a big figure eight. The cost is next to nothing. About R2.50 per ride. Calculate that when the US Dollar is about R10 and the British Pound about R18. 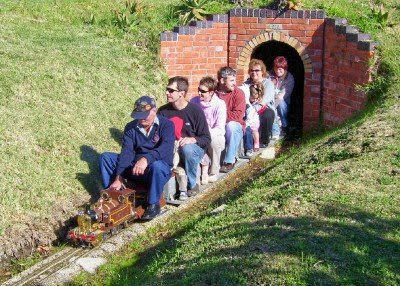 As this photo shows, the ride is as popular with the "big" kids as it is with the little ones. I for one always get excited when the Damselfly suggests that we take the Rugrats for a visit to the trains. I wonder when we will go again. 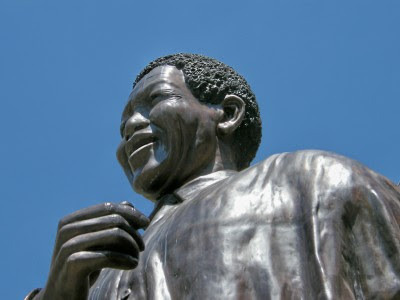 Today is the last day of our tour and we will make visits to the other two big tourist attractions in Oudtshoorn. Our first stop is the world famous Cango Caves. 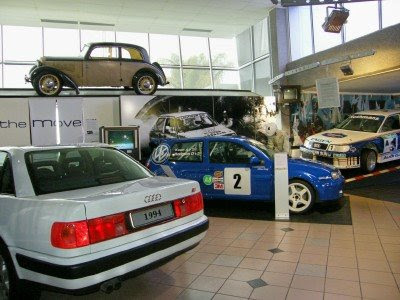 Situated about 20kilometres outside of town in the Swartberg (Black Mountains), the caves are the best known caves in South Africa and one of the most visited show caves in the world. The word Cango is a Khoisan word that means "water between hills". The Khoisan used to live in the entrance of the caves, but would never have gone into the caves itself because of their believe that their ancestors lived inside the caves. 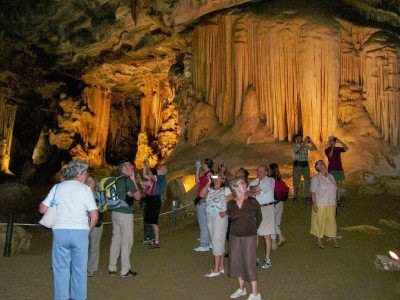 The caves offer two tipes of tours. Most people go on the Standars Tour that lasts an hour and takes you about 1 kilometer into the caves. The Adventure Tour will take you into some of the smaller passages that can be as low as 30 centimetres high. 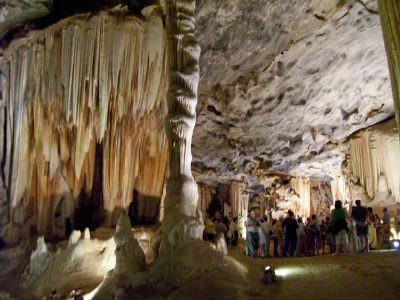 The first two caverns are huge and on the tour visitors will see all kinds of rock formations. Only the first section of the caves are open to the public. Cango 2, 3 and 4 are only open to researchers as that part of the caves is still an untouched living cave. Although the formation in the public section of the caves is awesome, due to human interference it is very dead compared to the other sections. The Cango Wildlife Ranch on the outskirts of town started out as a crocodile farm many years ago. In the last 10 years it has been turned into a centre where several endangered animal species are bred with while their tour and exhibits are designed to educate people about endangered species. The first section of the Ranch is called the Valley of the Anchients. It takes the form of a lost city with various animal displays, but don't think of it as a zoo. Part of this area is still dedicated to crocodiles. It is here that they offer something truely unique. Crocodile cage diving. 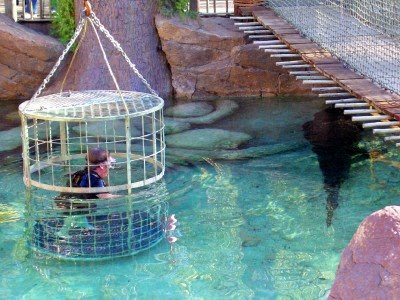 For a fee you can don a wetsuit and hop in a cage, get lowered into the pool inbetween foer or five humangus crocs. It looks awesome and I still want to do it one day. 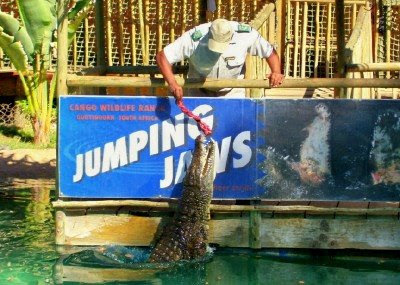 The also have a display where they show how one of the guides get a crocodile to jump out of the water and take a piece of meat from his hand. I wondered why some many of the guides there only have one arm. Just joking. The rest of the Ranch is dedicated to birds, wild dogs, pigmy hippos and of cause their Cat Sancuary where they breed with cheetah. Anyway, this is it for our Garden Route tour. I hope you enjoyed the trip. Yesterday we got as far as Mossel Bay. From there to Cape Town you drive through the Overberg which is mainly farming country and not much else. If you cross the Outeniqua Mountains from Mossel Bay (on the Robertson Pass) and George (on the Outeniqua Pass) you get to the Klein Karoo. 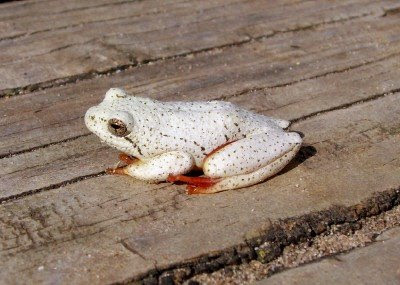 Klein comes from Afrikaans and means little while Karoo comes from the Khoisan language and means "Place of thirst". 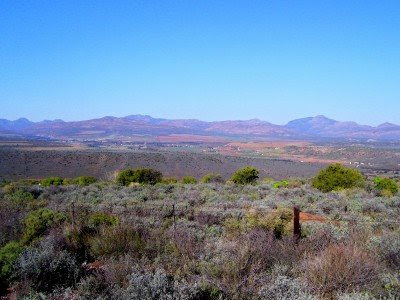 The Klein Karoo and in particular the area around the town of Oudtshoorn has become a natural extension of the Garden Route. The Klein Karoo is vastly different from the Garden Route in that as you cross the mountain you are in a different world. The area's climate is dry and hot with the vegetation consisting mostly of Karoo shrub, grasses and low bush (oh yes, and also lots of stones). The Klein Karoo is probably best known for its ostriches. There are many ostrich farms supplying both the local as well as the export market with ostrich meat. The meat is very healthy. Strangely ostrich meat is a red meat and has virtually no fat or cholesterol. This means that somebody with high cholesterol who can't eat red meat can still enjoy ostrich. Ostrich biltong (dried meat like American jerky, just better *hee hee*) is very popular here in South Africa while the feathers are exported for the use in costumes for festivals. 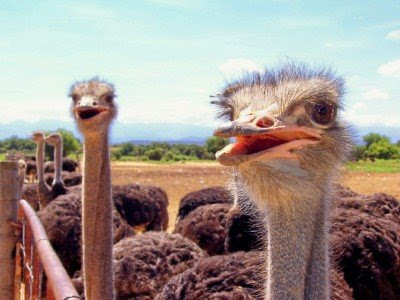 Some day when I'm really bored I will do an post on ostriches and give you all the nitty gritty of ostriches. 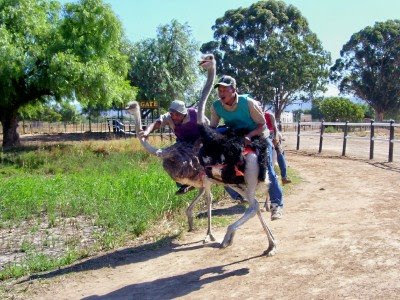 Around Oudtshoorn some of the biggest tourism attractions are the ostrich show farms. You can't visit the area without going to one of the show farms. Here visitors are showed everything there is to be known about the ostrich. From breeding to their legs, feathers and heads and then what products you get from ostriches. Then its on to the camps where visitors can have the opportunity to stand on an ostrich egg, touch an ostrich, sit on one or (if you weigh less than 75kg) even ride one. At the end of the visit professional ostrich jockeys (how many people can put that on their CV's) will do an ostrich race for the visitors. Here Michael Schumacher on the right and Hopeless on the left is having it out for first place. If i suddenly dissapear for a couple of posts, don't worry. I seem to be loosing bandwidth somewhere and have a feeling that somebody is tapping in from somewhere. I'm hoping the problem will be sorted out soon. Anyway, on with the tour. 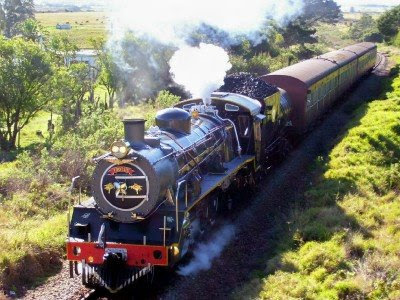 One of the most popular tourist attractions on the Garden Route is the Outeniqua Choo Tjoe steam train. Its usual route between George and Knysna was damaged very badly a couple of years ago and its furure was very bleak. Some bright spark then suggested that they run the other way from George and end up in Mossel Bay about 50km away. The trip takes about two or so hours and passes through a very scenic area, over a couple of rivers and along the coastline. Mossel Bay is situated exactly halfway between Port Elizabeth and Cape Town and is along with George the other big town on the Garden Route. The town is a very important commercial centre for the surrounding area. 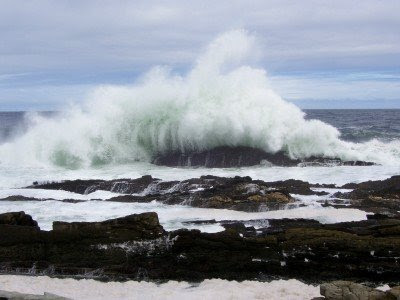 The name Mossel Bay came from some of the first European explorers to come into the bay. The found a cave near the point of the bay full of mussle shells and called it Mossel Bay. The modern thinking on the reasons for the shells was that they were part of a Khoisan midden (junk heap) in the cave. 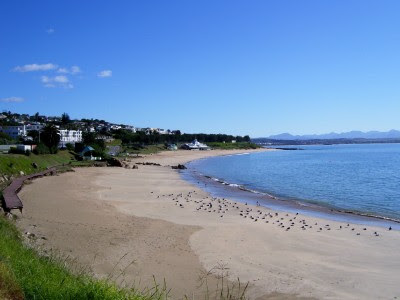 Mossel Bay is situated inthe only fully north facing bay on the South African coastline. It has the second most temperate climate in the world after Hawaii (Port Elizabeth is apparently fourth on that list) and has some beautiful beaches. Now this is not to scare anybody off from swimming there, but the ocean outside the bay is also one of the best areas in South Africa (after Gans Bay and False Bay) to do cage diving to watch the Great White Sharks. The thing that Mossel Bay is most famous for is the fact that this is the spot where Bartholomew Dias became the first (known) European explorer to set foot in SA in 1488. 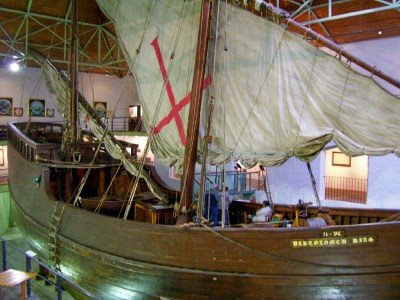 In 1988 a replica of his Caraval was built in Portugal for the 500th anniversary of the event and was sailed to Mossel Bay. The replica is the centre peace of the Diaz Museum complex on the beachfront. The town of George is one of the two big (ok, biggish) towns in the Southern Cape. 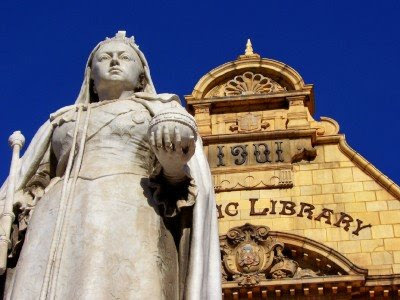 Established in the early 1800's, the town was the first to be founded in the then Cape Colony by the British and was named after King George III. 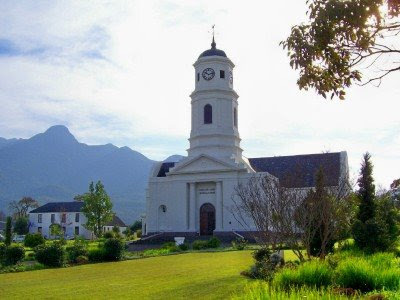 Along the main road through George you will find the NG Kerk Moedergemeente (Dutch Reformed Church's Mother Congregation of the Southern Cape). The building is one of George's historic landmarks. Georges is located at the foot of the imposing Outeniqua Mountains. 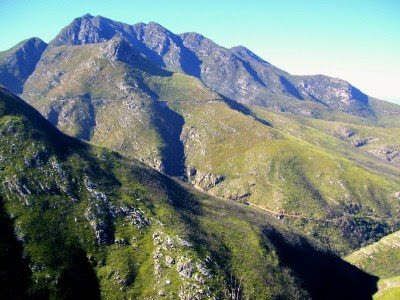 The word Outeniqua means "Men laden with honey" in the Khoisan language and refers to the old days when the local Khoisan tribes went into the mountains to fetch honey from the wild bees. There are four passes that cross the mountains. The original pass was called the Cradock pass and is now a hiking trail. The second pass, the Montagu Pass follows one of the valleys through the mountain and is a gravel road that is still accessible. The "new" pass is called the Outeniqua Pass and is a awesome pass that cross the mountain into the Klein Karoo (more on that area when we get to Oudtshoorn in a couple of days). 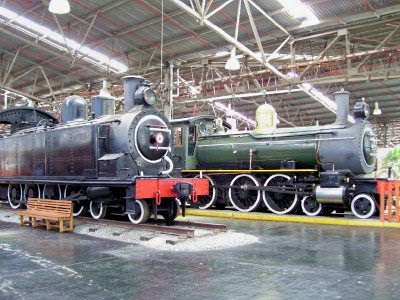 Outeniqua Railway Museum can be found at the George station and is a big shed with a varied collection of steam trains, historic carriages, historic station goodies and vintage cars. It is from here that the Outeniqua Choo Tjoe departs. That trip we will do tomorrow. Also departing from the Railway Museum is the Outeniqua Power Van. These historic restored electric railway vans will take you on the fourth pass up the Outeniqua Mountains, the railway pass. They will take visitors up to the top of the pass to enjoy the magnificent scenery of the mountains with it surrounding forests and plantations and the town below. Before I get to today's part of the tour, I just want to answer a couple of questions that Ann had. Ann asked why the entrance through the Knysna Heads are so dangerous and if there were any plans for a breeding program for the elephants. There are several factors that make the Heads so dangerous. The entrance is about 200m wide although only about 70m are accessible to boats. There are two sandbars just outside the heads that make for the sudden development of waves, there is a submerged rock to the one side, the current through the Heads both in or out is in the region of about 11 knots which means having an engine failure could be catastrophic and lastly wind gets trapped between the Heads which is dangerous for sailing ships. That is it in a nutshell. As far as breeding of elephants go. Research show that the elephants are the same subspecies as the other elephants found in South Africa. The difference is that the have adapted to living in the forest. A couple of years ago they tried to introduce a couple of young orphaned elephants into the forest. They just cut a beeline to the nearest fields and destroyed fences in the process. Unfortunately they had to be removed. The next stop on the tour is Wilderness. 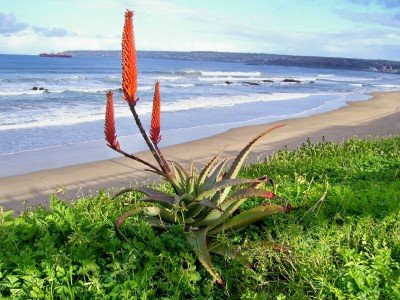 Wilderness is a lovely quite little town which has not developed as much as the other towns on the Garden Route. There is a story behind the name of a young man living in one of the town in the area long ago. He asked a girl to marry him and she said yes, but on the condition that they live out in the wilderness. Little did she know that he had a farm which he called Wilderness to accommodate this request. This view is looking eastwards from Dolphin Point. Wilderness beach is a long stretch of sand which is very popular during the holiday season. The haziness is sea mist which hangs over the area just about permanently as it is trapped by the surrounding hillsides. Looking west from the point you see the Kaaimans River with the Kaaimans Bridge across it. This is part of the route that the Outeniqua Choo Tjoe steam train used to take. A couple of years ago the track was very badly damaged in heavy floods and have not been repaired. 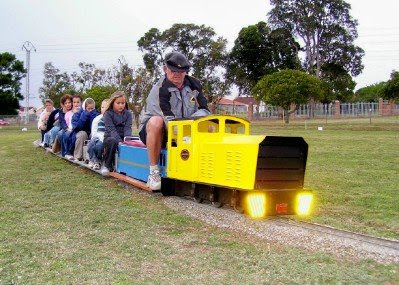 The train now runs the other way towards Mossel Bay. Tomorrow I will post about George and the next day the train and Mossel Bay will have its turn. Photos of the Choo Tjoe crossing the bridge can be found in just about any guide and photo book out there. My apologies for missing yesterday's post, but I had some problems with my internet. All fixed now and back to our tour. 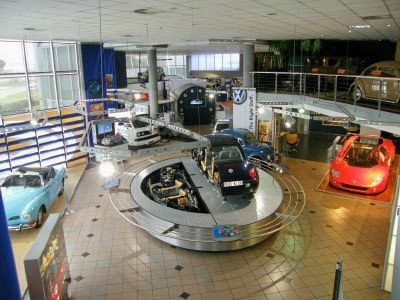 The next town on the tour is supposed to be the millionaires' playground of Plettenberg Bay. 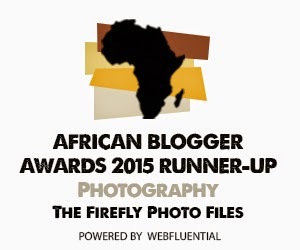 Unfortunately I don't have any good digital pics of the town so we will bypass it and move on to the town of Knysna. 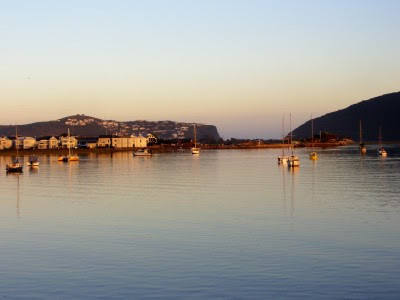 Knysna have twice been voted South Africa's favorite town and is the most popular town on the Garden Route. The word Knysna (pronounced with a silent K) is a Khoisan word which means "the woods down there". 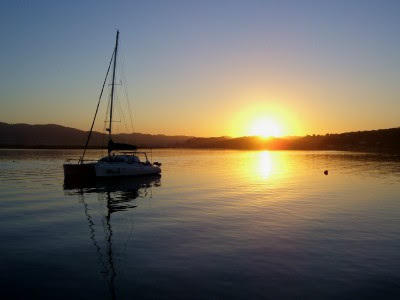 Knysna is built on the banks of the Knysna Lagoon and is wedged between the lagoon and indigenous forests. 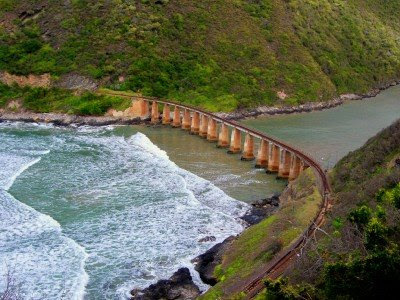 The entrance into the lagoon is called The Knysna Heads and is rated as one of the most dangerous entrances to a natural harbour in the world. Loyd's of London won't even insure your yacht if you state that you will be entering through the heads. The land on the Eastern Head has been developed as a very upmarket residential area while the Western Head is part of the Featherbed Nature Reserve. The lagoon itself is a protected area and falls under the control of South African National Parks. There are numerous activities to be done in and around the town. 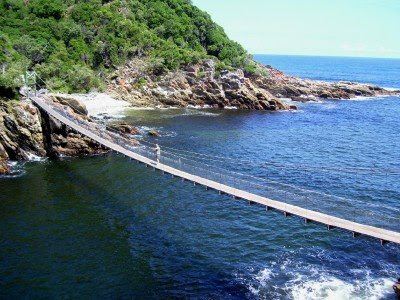 The most popular activity for tourists is to go on a ferry trip from the Knysna Quays to the heads and back. The best trip of the day is the sundower trip. Other activities range from hiking in the woods, quad biking, mountain biking, sailing and shopping. The Knysna area is a heaven for artists and there are loads of shops selling art and curios. 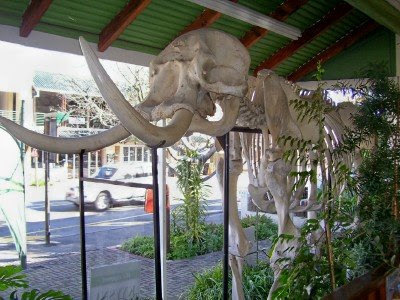 There used to be hundreds of elephants living in the forests of the Southern Cape during ages gone by. Over the last couple of decades development have meant that their numbers have dwindled. About 10 or so years ago it was thought that there were only one elephant left in the forest, but every now and then the forest rangers found evidence of elephant activity. Research have now shown that there may be about 5 or six positively identified individuals but there may be more. 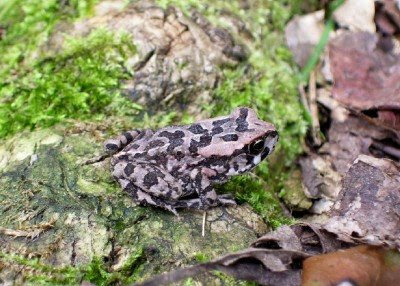 They are extremely elusive with only a couple of glimpses by the rangers and even less photographic proof. This skeleton is on display at the National Park offices in the town. 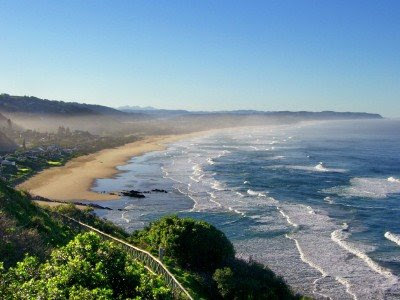 Seeing that we started touring down the Garden Route I decided to just continue and show you why it is such a popular tourist route. I may interrupt the tour every now and then to do other posts, but we will keep on making our way westwards. 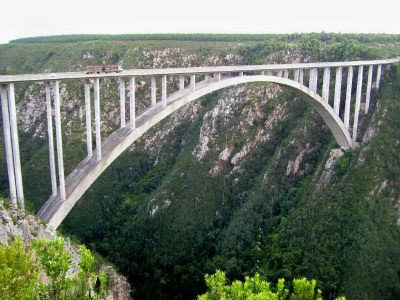 The next stop after the Tsitsikamma National Park and the Bloukrantz Bridge is Birds of Eden, situated just outside the town of Plettenberg Bay. Birds of Eden is the World's Biggest Free Flight Bird Aviary. The park has about two hectares that has been enclosed. The catch is that when you are inside the aviary it doesn't feel like you are in an enclosure. The enclosure is divided into two sections. The first section is a forest environment with a stream and waterfalls while the second section is an open area surrounding a dam. As you walk through the forest there is one section where a rain forest is being created. The sun shining through the rain made for some excellent photos. In one spot the walkway goes behind a waterfall and the split in the water with the walkway in the background made for another great photo opportunity. But the best thing about the park is obviously the birds. Although you aren't allowed to touch them, they can come to you and because of the fact that they are used to people you can get very close. This makes for super (I didn't want to use the word excellent again and I tend to use awesome way too much) photo opportunities. 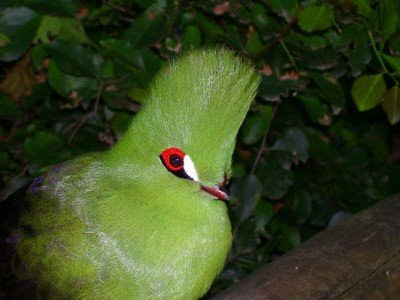 This green bird is a Turaco or locally known as a Loerie. They are very elusive birds that live in the indigenous forests. You often hear them (they actually sound like baboons in the distance), but rarely see them because of their green plumage. They hop from branch to branch and when they glide to the next tree they reveal their bright red feathers under their wings. Over the last couple of days I've done some posts on the area called the Tsitsikamma on the Garden Route west of Port Elizabeth. 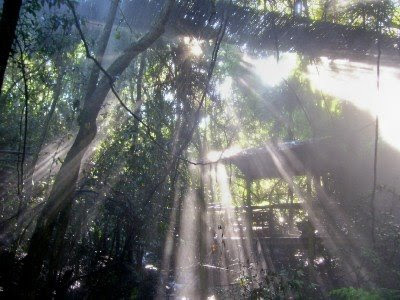 The word Tsitsikamma comes from the original inhabitants of the area. The Khoisan called it Tsitsikamma which means "Place of many waters" due to its high rainfall. 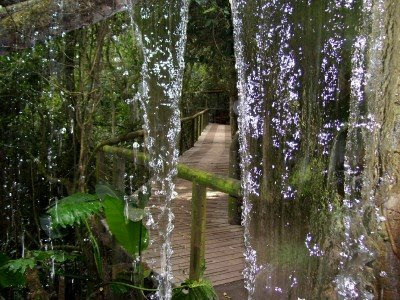 The jewel in the crown of the Tsitsikamma is the Tsitsikamma National Park. The Tsitsikamma National Park was proclaimed in the early 1960's and became the first marine reserve on the coast of Africa. Stretching over 80km long the park is probably one of the most scenic spots in the whole country with lush green indigenous forests stretching down to cliffs and an awesome coastline with black rocks and white breakers. Truly a photographer's paradise. There are two rest camps in the park. 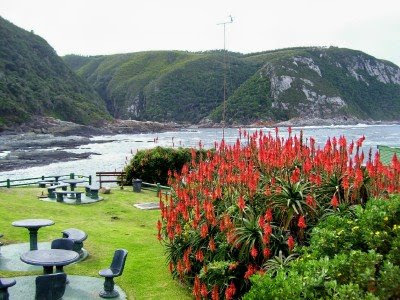 The main one is the Storms River Mouth Rest camp, while there is a smaller one at Nature's Valley. The orange flowers on the photo above is a type fence aloe. I have posted a pic of a sunbird on one of these flowers before. At the main rest camp there is accommodation ranging from chalets to caravan and tent sites, picnic spots and loads of walking trails. Most visitors to the park are day visitors who come to walk the one kilometre trail to the mouth of the Storm River. At the end (well, actually the turning point as you still need to walk the one kilometre back) visitors will find the suspension bridge that crosses the river mouth. The walk through the forest is an easy one and is on a boardwalk all the way. The coastline is a awesome sight (I have said that before haven't I). There aren't a lot of sandy beaches in the park so most of the coastline is rocky and when the sea is a bit rough the white waves and black rocks make for great photos. The rock is called "Skietklip" which means shooting rock and the water shoots several meters into the air when the tide is just right. One of my favourite photos of my kids is Chaos Boy standing on the rocks looking at the waves during a camping trip there last year. 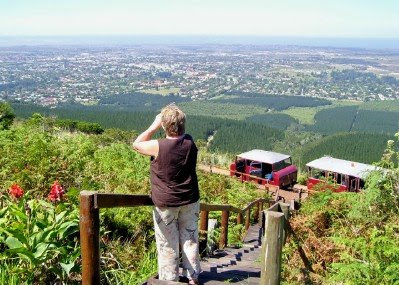 The Garden Route is not just a very scenic area but also an adventure junkie's playground with near countless activities to be done by thrill seekers of all shapes and sizes. 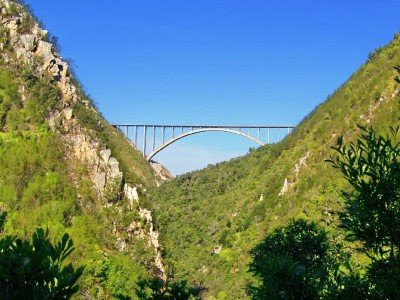 The ultimate adventure activity can be done at the Bloukrantz River Bridge in the Tsitsikamma. 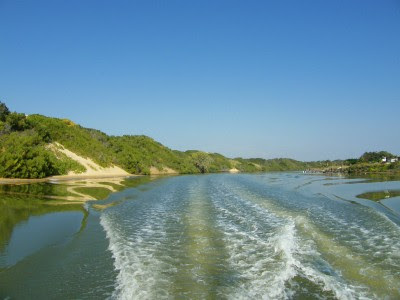 The river is also the boundary between the provinces of the Eastern Cape and the Western Cape. 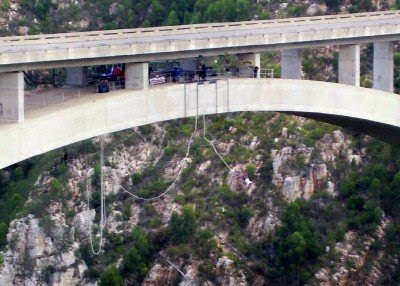 Here you will find one of the highest commercial bungy jump sites in the world. Measured at 216 metres high and 400 metres long, the bridge is the 10th highest bridge in the world. Jumpers get into their harnesses after signing in and then get a safety briefing. They then follow a path down to a catwalk attached to the side of the bridge that will take them the 200 metres to the middle of the bridge. Here they are met by the jumping personnel who will attach jumpers to the bungy cord before doing the count down. 5...4...3...2...1...BUNGY!!!!! The leap must be death defying. I wouldn't know because I have this little issue with heights. The only way that you will ever get me leaping off would be if I got into a South African version of The Amazing Race and there is no such thing at the moment. Anyway, I'm digressing. The first rebound is as much as the previous highest jump at the Victoria Falls. On the middle photo you will see the jumper below the bridge while the rope to the right has several windsocks on it for measuring purposes. 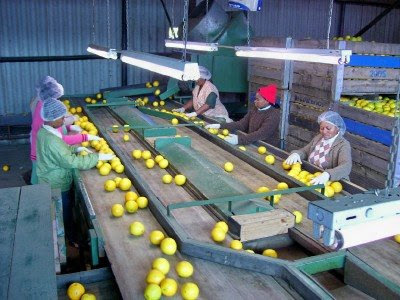 There are two areas within an hour's drive from Port Elizabeth that are major citrus, and in particular orange, farming districts. The Sundays River Valley is to the north of the city while the Gamtoos River Valley is to the west. The Gamtoos Valley is often called the food basket of the eastern Cape as they grow all kinds of crops there. The main products are oranges and potatoes, but they also grow lots of pumpkins, cabbage, cucumbers, watermelons, chicory and tobacco just to name a few. The valley is also home to one of the three big dams supplying water to Port Elizabeth and environs. The valley is very scenic with loads of tourism potential. The oranges gets picked by hand and put onto trailers pulled by tractors. The oranges then get taken to the co-operative or a private sorting facility to be sorted and packed. The trailers get lifted on the one side and dumps the oranges in a tank water. It is so that the oranges don't get damaged as well as to clean them. 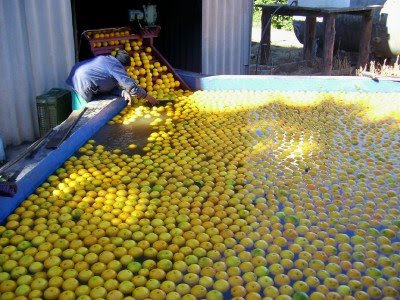 From there the oranges get coated with a wax coating to seal in the freshness before the sorting process start. In the big Co-op most of these activities gets done through automation, but the smaller private facilities still do it by hand (and thus create a lot of job opportunities), The bad (rotten or damaged) oranges get taken out and that will either go to the pig farmers (rotten) or the juicing factory (damaged or undersized). The oranges then get sorted by size. 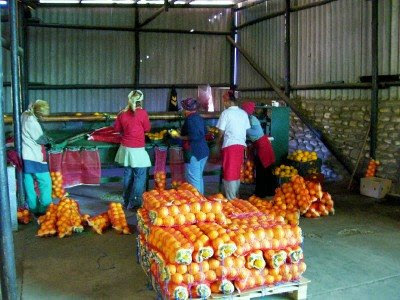 The big oranges are of export quality and get packed into boxes, transported to the Port Elizabeth harbour and put into cold storage before loaded onto ships heading to Europe and Asia. The "normal" oranges for the local market get packed into orange bags which get taken to the fresh produce market or sold directly to supermarkets and fruit and veg stores. So I don't really know the difference between grasshoppers and locusts. 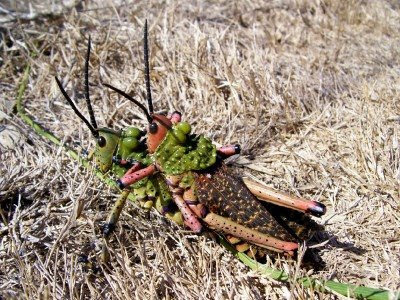 Wikipedia tells me locusts are several types of grasshoppers that would swarm at times. Around here I haven't seen any swarms, so these must be grasshoppers. 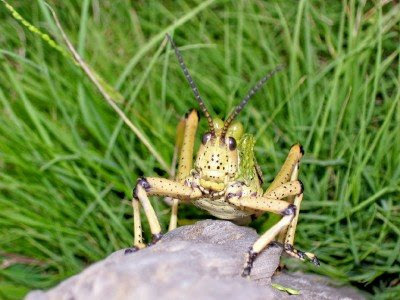 What confuses me more is that in Afrikaans we just say "Springkaan" which is grasshopper for all of them. Whatever! I'm not really one that likes to get too close to things like spiders, grasshoppers or anything with more that four legs, but when there is a camera between me and them it is amazing how close I will get for that shot. So here is a variety of shots I have of our normal garden variety (at a loss for a proper name) grasshoppers. 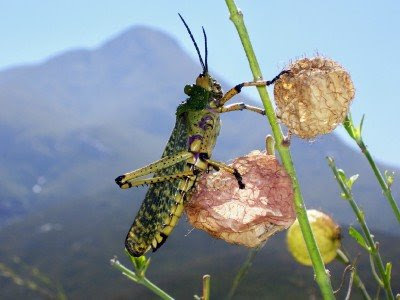 This pic comes from the Outeniqua Mountains in the Southern Cape. This one is sitting on a plant called a kapok bush, also known by some people as "Old Mans Balls". Not being an old man I can't guess why its called that. This grasshopper was sitting on a pole in one of the game reserves. I chased him around the pole several times before he decided to just sit still and get it over with. He even smiled at me. Or was it a smirk? For these two I can only say one thing: "Get a room!" Well, they are assuring the continuation of the species. Oh look, the male is blushing. LOL.